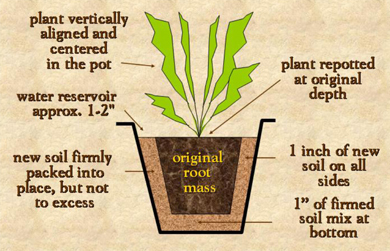 * When the roots can be seen growing out from the bottom or top of it's pot. Whitish or off-colored residue can be seen on the top of the soil or around the pot's base and saucer. This is a sign of chlorine(from your water) and/or salt(from your fertilizer) building up. If brown spots appear in the middle of the leaves or at their tips and no new growth has been observed for a long period of time. Make sure you choose quality potting soil for your repotting job. Beware of 'cheap' soils, in this case, you usually get what you pay for. When replanting your houseplants, we recommend 'bumping' up just one pot size larger, and always provide drainage holes. HAPPY GARDENING!